I’ve mentioned this on Instagram before, but one of my local indie bookshops is just down the street from the place I get my hair done. I stop by to browse their picture books nearly every time I walk by, and thus I buy their latest selection, because I have several little ones in my life and no self-control in bookstores. 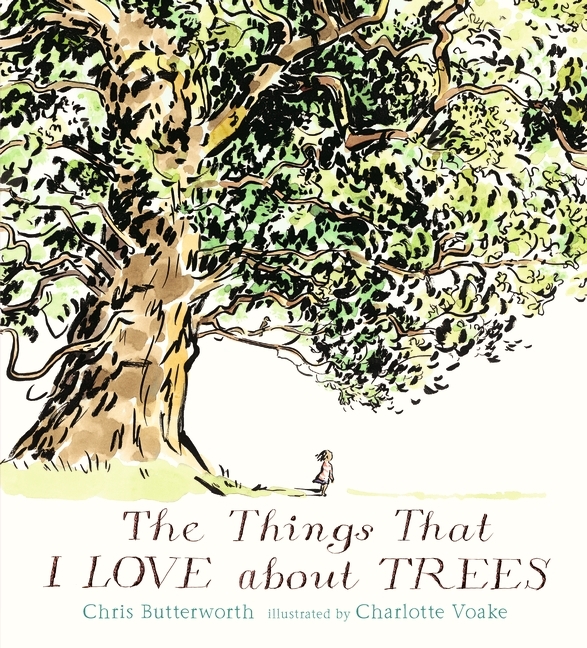 I picked up Chris Butterworth and Charlotte Voake’s The Things That I Love About Trees the last time I was there, and I really adore it. In an exuberant text accompanied by gorgeous, windswept illustrations, two esteemed picture-book creators celebrate the mighty tree. Journey through the seasons and discover how much there is to love about trees! From brand-new buds in spring to the sound of the wind whooshing through the leaves in summer, from the fall colors to the feel of winter's rough bark and the promise of spring returning again -- no matter what time of year, there's always something extraordinary to notice about the trees around your neighborhood. Chris Butterworth's text, gently sprinkled with facts, captures the wonder of a child as Charlotte Voake's busy, buoyant artwork conveys how something as simple and common as a tree can feel like magic taking root around you. There’s just something wonderful about trees, isn’t there? I’ve always thought so, and I especially thought so growing up in the Pacific Northwest with a front yard full of trees, forts, and pine needles. Chris Butterworth’s nonfiction picture book about trees leads readers through the seasons, starting with spring, and describes how trees act and grow in the changing environment. 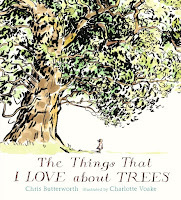 The Things That I Love About Trees invites engagement with the senses – Butterworth tells readers how trees react to hot days and storms, reminds them what to listen for, and describes the feel of bark and leaves. It may be printed on traditional paper, but it is a sensual buffet. It made me want to go outside on a tree-spotting walk, and I’m sure others will feel the same! This book is perfect for a range of young readers – very little ones will love the illustrations and simplicity of the big text story that goes on a seasonal journey. Slightly older and independent readers will enjoy the brief tree facts in smaller text on each page. Adults will appreciate the book’s year-round readability, as each season in a tree’s life cycle is represented. The combination of beautiful art and interesting tree facts ensure that this book will be re-read over and over with love. Oh, did I mention the art? Charlotte Voake’s illustrations are done in beautiful ink and watercolor, with broad, abstract strokes contrasted with precise, tiny details. The illustrations allow for generous white space on most pages, and the humans and animals included in the illustrations provide scale to trees (and keep the book from being an overwhelming smorgasbord of greenery). The human figures are mostly fairly indistinct – trees are the focus of the book, after all! The pages depicting enormous summer-time tree trunks were perhaps my favorite – they reminded me of the great trees I’ve seen in my life. My two personal favorite things about the book were the endpapers, which feature close-ups with different kinds of tree leaves and their identifying information, and the final page spread at the end which suggests tree-adjacent activities and guides younger readers in how to do research! The author doesn’t talk down to his young readers, and that’s always nice to see. In all, The Things That I Love About Trees is full of facts that will delight curious kids, and perhaps prompt them to want to learn more (and see more)! Recommended for: tree-lovers and -huggers of all ages, young readers who want to know how things work, fans of Kate Messner's Over and Under the Snow, and teachers doing environmental, natural world, and season-focused units. Awww, getting your hair done and then buying books afterward sounds like the perfect time. Especially if you're buying books for the little nuggets in your life, because then you get all the book-buying endorphins and experience none of the guilt.